Higher Nature Complete Omegas 3:6:7:9 provides Omega 3 EPA & DHA from Fish oil, for heart support, arteries, eyes, brain & joints + GLA for hormone balance. 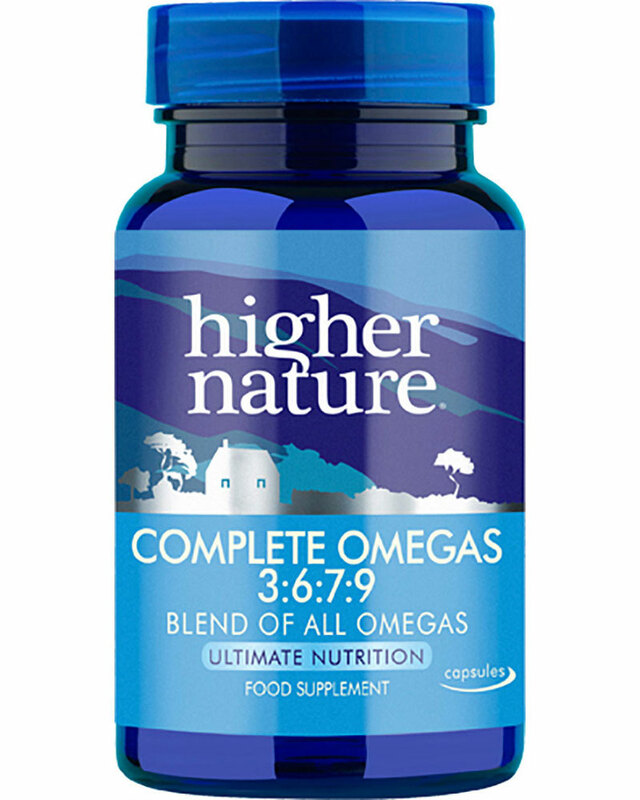 This complete nutritional omega complex provides Omega 3 EPA and DHA from Fish oil, which are important for supporting the heart, arteries, eyes, brain and joints. In addition, GLA from starflower oil plays a role in maintaining hormone balance and joint and skin health. Omega 7 from Sea Buckthorn oil has been found to have an affinity for the skin and mucous membranes of the digestive and urinogenital tracts. Omega 9 from extra virgin Olive oil is a key feature of the Mediterranean diet, which is known to have benefits for cardiovascular health. Scrupulously screened for pollutants, to ensure the highest purity. A carefully blended mix of premium quality Omega fatty acids (3,6,7 and 9), balanced to optimal levels of each to ensure an adequate intake of the essential mix of polyunsaturated and monounsaturated fatty acids. Omega 3 and 6 (polyunsaturated) fatty acids are essential and must be sourced from the diet. Omega 7 and 9 (monounsaturated) fatty acids are not considered essential as they can be manufactured by the body. However, their inclusion in the diet has been associated with many positive health effects. EPA and DHA from fish oil are the key Omega 3 fatty acids, important for supporting the health of the heart and arteries, the brain and flexible joints. Scrupulously screened for PCBs, dioxins and other pollutants to ensure the highest purity possible. GLA from borage oil is a key Omega 6 fatty acid, which plays a role in maintaining hormone balance and the health of the skin, circulatory and immune systems. Omega 7 from Sea Buckthorn oil has been found to have an affinity for the skin and mucous membranes of the digestive and urogenital tracts and is now considered an important fatty acid for nourishing, replenishing and moisturising these delicate tissues. Omega 9 (oleic acid) from Virgin Olive oil has well-known benefits to cardiovascular health and may also be necessary for healthy immune system functioning. For the first time, all four fatty acids are available in soft gelatine capsules (bovine source). 680mg EPA (eicosapentaenoic acid from fish oil), 480mg DHA (docosahexaenoic acid from fish oil), 180mg GLA (Gamma-linolenic acid, from Starflower oil), 36mg Omega 7 (Palmitoleic acid from Sea Buckthorn oil), 112mg Omega 9 (Oleic acid from extra virgin Olive oil). Gelatine, glycerine, mixed tocopherols, natural vitamin E.
Take 4-6 capsules a day (children under 6 years, 2 capsules a day; capsule may be snipped and contents sprinkled onto food); older children 2-6 capsules a day, with meals.